Brother Francis Xavier O’Neill, who served in the Brothers of Mercy Mary Help of Christians for 75 years, died Monday on the Brothers of Mercy Campus, Clarence. He was 94. Born Donald Arthur O’Neill in Wyandotte, Mich., one of seven children, he joined the Brothers of Mercy after graduating from high school without ever visiting the community. 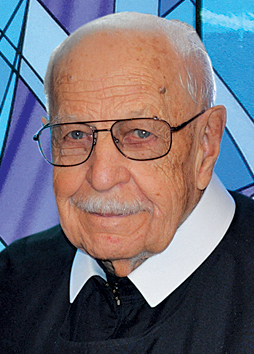 He professed his first vows on Sept. 8, 1945, and his final vows on Sept. 8, 1951. He studied at the Mercy Hospital School of Nursing, becoming a registered nurse and later a certified registered nurse anesthetist. He first worked as a private duty nurse, making medical house calls day and night by bicycle. While caring for his aging mother, he was a nurse anesthetist in Detroit for 13 years, specializing in newborn care. In the 1960s, he served in a Brothers of Mercy Hospital in Africa. He also supervised a 100-bed Brothers of Mercy retirement home in Kansas City, Mo., and twice was a nursing home supervisor in Oklahoma City, Okla.
From 1959 to 1963, he was provincial superior of the Brothers of Mercy North American Province in Clarence. After retiring at the age of 91, he continued to enjoy fishing and watercolor painting. Survivors include two sisters, Rose Celine Cowan and Mary Ann Kowalski; a brother, Pat; and nieces and nephews. A Mass of Christian Burial will be offered at 10 a.m. Saturday, March 23, in Brothers of Mercy Sacred Heart Home Chapel, 4540 Ransom Road, Clarence.